THEODORE ROOSEVELT. 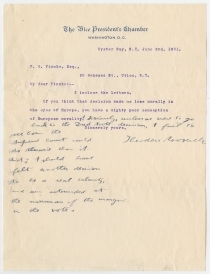 Typed Letter Signed with extensive manuscript addition, June 3, 1901, to F. G. Fincke, Oyster Bay, New York. On “The Vice President’s Chamber / Washington, D.C.” letterhead, 1 p., 7¾ x 10¼ in. With envelope with pre-printed free frank. If you think that decision made us lose morally in the eyes of Europe, you have a mighty poor conception of European morality! [below, in Roosevelt’s hand] Seriously, unless we were to go back to the Dred Scott decision, I fail to see how the Supreme Court could do otherwise than it did; I should have felt another decision to be a real calamity, and am astounded at the narrowness of the margin in the vote. In a series of six to nine cases decided in 1901, together called the Insular Cases, the Supreme Court held that the full constitutional protection of rights does not automatically extend to all places under American control. The Court created a distinction between incorporated and unincorporated territories. Incorporated territories were those that the government deemed to be on a path to statehood, such as Oklahoma, New Mexico, and Arizona. In the latter category, which included Puerto Rico and the Philippines, the Constitution did not “apply in full.” Congress had the discretion to extend as much of the Constitution as it chose to these areas. Almost all of the cases were decided by a Court divided 5-4, and the reaction of the press was often critical. The announcement of decisions in the Dooley v. United States, Armstrong v. United States, and Downes v. Bidwell cases on May 27, 1901, drew the largest crowd in Supreme Court history. In the first case, the firm of Dooley, Smith & Co. sued the United States for refund of duties it paid under protest at the port of San Juan, Puerto Rico, on merchandise imported from New York between July 1898 and May 1, 1900, when the Foraker Act took effect. The court held that those duties paid before the ratification of the Treaty of Paris on April 11, 1899, were valid under the war power. Those paid after that date had to be refunded. In other words, at the ratification of the treaty, Puerto Rico ceased to be a foreign country and became a territory of the United States, until Congress legislated further upon the subject. In the third case, merchant Samuel Downes sued U.S. customs inspector George R. Bidwell to avoid paying duties on oranges he imported from Puerto Rico, arguing that the Constitution provided for uniform “duties, imposts, and excises” throughout the United States. Justice Henry B. Brown (1836-1913) joined the four dissenters in earlier Insular Cases to declare that Puerto Rico was not properly part of the United States with regard to the revenue clauses of the Constitution. Therefore, the Foraker Act was constitutional in imposing duties on trade between the United States and Puerto Rico, such as Downes’ oranges. Six days later, Vice President Roosevelt wrote this letter to his friend in upstate New York. Like other Republicans who favored the expansion of the United States, Roosevelt was pleased that the majority of the Court had decided that the new possessions belonged to the United States and were therefore under the authority of Congress, but that their inhabitants were not U.S. citizens. Roosevelt referenced the Supreme Court’s notorious Dred Scott decision of 1857, which declared that the federal government had no power to regulate slavery in the federal territories, thus ruling the Missouri Compromise of 1820 to be unconstitutional. That case was only the second time that the Supreme Court had declared an act of Congress to be unconstitutional. The Dred Scott case also declared African Americans could not be American citizens. On October 10, Fincke wrote to Roosevelt about a recent conversation he had with Congressmen Lucius Nathan Littauer and James S. Sherman from New York. “Both expressed not only respect & loyalty but affection for you,” Fincke wrote. “There was no need of their talking through their hats or lying to me. They know I am not in politics & do not want to get in. I believe they meant all they said.” “Situated as I am,” Fincke concluded, “I think I get more honest & [unreserved?] expression, than I otherwise would.” Roosevelt and Fincke continued corresponding at least through 1902. Theodore Roosevelt (1858-1919) was born in New York City, graduated from Harvard University in 1880, and attended Columbia Law School. He served in the New York State Assembly from 1882 to 1884, and as president of the New York City Police Commissioners in 1895 and 1896, then as Assistant Secretary of the Navy from 1897 to 1898. After service in Cuba during the Spanish-American War, he won election as Governor of New York and served from 1899 to 1900. He ran as Vice President to William McKinley in 1900 and became President in September 1901, when McKinley was assassinated. Reelected in 1904, Roosevelt was President until 1909. A prolific author and naturalist, Roosevelt was instrumental in the Progressive movement of the early twentieth century, helped preserve the nation’s natural resources, and extended American power throughout the world with a focus on a modern navy. In 1912, he again sought the Republican nomination for President, but when the convention chose incumbent William Howard Taft, Roosevelt formed the Progressive Party and outpolled Taft in the general election. The Republican division allowed Democrat Woodrow Wilson to win the presidency. Overall very good, with a bit of ink feathering. Roosevelt was not the only one making comparisons to the Dred Scott case. See pioneering political scientist John W. Burgess’ essay, “The Decisions of the Supreme Court in the Insular Cases,” Political Science Quarterly 16 (September 1901): 486-504. The first time the Supreme Court declared an act of Congress unconstitutional was Marbury v. Madison (1803). Chief Justice John Marshall, writing for a unanimous Supreme Court, held that a provision of the Judiciary Act of 1789 was unconstitutional, but the case also established the principle of judicial review over acts of Congress. Theodore Roosevelt to Frederick G. Fincke, June 7, 1901, Elting E. Morison, ed., The Letters of Theodore Roosevelt, 8 vols. (Cambridge: Harvard University Press, 1951-1954), 3:88-89. Theodore Roosevelt to Frederick G. Fincke, October 1, 1901, Theodore Roosevelt Papers, Library of Congress, Washington, DC. 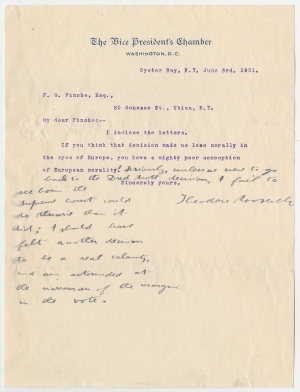 Frederick G. Fincke to Theodore Roosevelt, October 10, 1901, Theodore Roosevelt Papers.